The sight of a family of deer resting on your front yard may bring a feeling of connection with wildlife. All is right with the world until you take a look at the damage to your ornamental plants. Deer feed voraciously on expensive shrubs, annuals and perennials. Homeowners often experience major damage to shade plants since deer naturally shelter in shady, protective locations under mature tree canopies. Selecting deer-resistant shade flowers allows the animals to share the living space without damaging your flowering landscape plants. Bergenia (Bergenia cordifolia), also called pigsqueak or elephant's ears, features thick leather-like foliage in deep green hues. The rough texture of the foliage discourages foraging by deer. This perennial plant grows best as a border plant and prefers partial shade. Flowers appear as cup-shaped clusters on longer stems spaced above the clump of foliage. Flower colors include violet, red, pink and white. Foliage transforms to a red or bronze hue in the fall. Bergenia likes well-drained, organic soil and reaches a mature height of 1 to 2 feet. Allow plenty of space to accommodate the 1 1/2-foot spread of the mature plant. Plant bergenia in USDA Hardiness Zones 3 to 8 for best growing results. Add spice and bright purple color to the shade garden with monkshood (Aconitum napellus). The perennial monkshood grows in USDA Zones 3 to 8 and produces thick foliage with a texture that doesn't invite grazing by deer. Monkshood produces flowers in late summer that features an upright stalk with spikes of purple-hued flowers. Plant in partial shade, and provide well-drained rich soil. Monkshood reaches a mature height up to 5 feet and widths of over 1 foot. This plant is poisonous, which may account for deer avoidance. Don't plant near edible plants. Begonia (Begonia x semperflorens-cultorum) produces flowers in pink, white or red for consistent color in the shade garden. 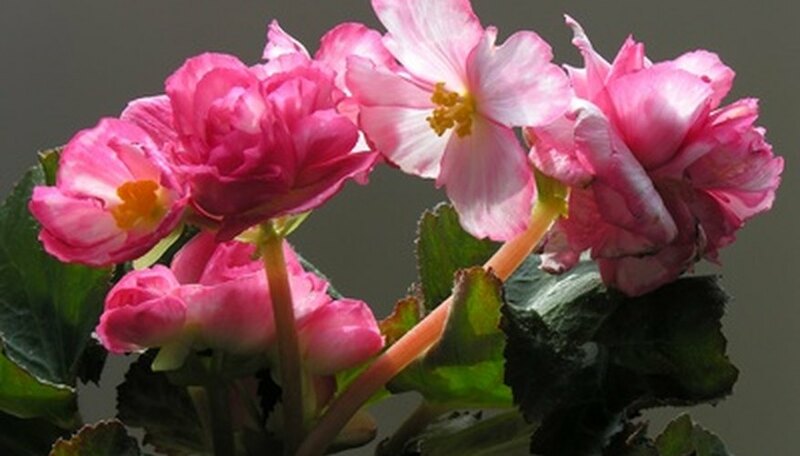 As an annual plant, begonia retains flowers throughout the summer growing season. Flowers feature slightly cupped petals with a yellow center. Mature plants reach up to 15 inches high and wide. Thick succulent foliage discourages snacking by deer. Foliage color ranges from deep green to red and bronze. Begonias like moist planting sites and grow in a mounded form for use as a border plant.